We grow only large Sangiovese grapes, also known as Prugnolo Gentile, with a clonal selection based on the soil composition. The age of the vines ranges from fifteen to fifty years. - 2 hectares of old vines (50 years old) with a traditional plantation of 3,500 vines per hectare with the guyot pruning system. The soil is fertilized annually with green manure, deposited in alternate rows with the addition of organic fertilizer as needed. No herbicides or other chemical or systemic products are used and the few treatments actually performed on the vines are copper- and sulphur-based. The care of the vineyard is based on an assiduous search for processes that increase the plant’s intrinsic defence systems. In fact, the deep tilling of the soil, the breakage of superficial roots, the organic and energy-efficient green manure fertilizer and watering with natural extracts are all practices that increase the vineyard’s natural defences, consequently preventing the winemaker from having to use other synthesis products. In terms of agronomy practices, shoot thinning is performed (the actual pruning of the grape) along with only a late, single tipping, because bending the shoots is preferred as a natural way to increase the acidity level. 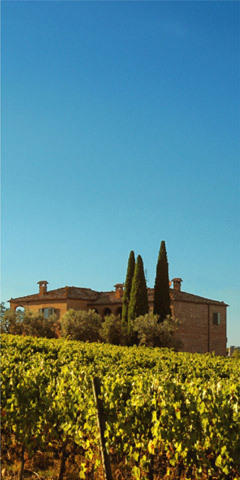 When necessary, bunches deemed to be excessive are thinned out to obtain a yield of approximately 1 Kg of grapes per vine, reaching a production of 60,000 Kg of grapes per hectare, which is still below the maximum limit of 80,000 Kg per hectare established by the Vino Nobile di Montepulciano Consortium regulations. The fruits are harvested and selected directly in the vineyards then brought over to the stemmer in small 15-kg crates to ensure they remain intact.